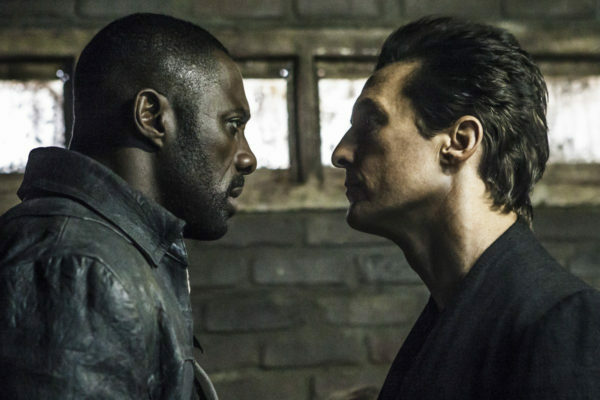 Roland (Idris Elba) and Walter (Matthew McConaughey) in Columbia Pictures' "The Dark Tower." “The Dark Tower,” Sony Corp.’s adaptation of a Stephen King book series, opened as the top North American film, ending a two-week run for “Dunkirk” with one of the lowest weekend tallies for a No. 1 picture this year. The movie collected an estimated $19.5 million in U.S. and Canadian theaters, researcher ComScore Inc. said Sunday in an email. It fought a close battle with Warner Bros.’ “Dunkirk,” which placed second with $17.6 million, and also beat “Kidnap,” the other film opening in wide release, which landed in fifth place. August marks a stretch with no blockbuster releases on tap, enabling studios to capture the No. 1 spot with a modest turnout. Sony Pictures, in turnaround mode under new studio chief Tom Rothman, has had two lackluster releases in a row — this weekend’s “Dark Tower and “The Emoji Movie” on July 28. With both films, which scored low marks from critics, the studio made reviewers agree to hold their critiques until the Wednesday night before opening. The overall box office total for this weekend was about half that a year earlier, when Warner Bros.’ “Suicide Squad” opened with a blockbuster $133.7 million, ComScore said. This summer’s take is about 11 percent below last year’s, Dergarabedian said. “There just weren’t enough good titles to outweigh the negatively reviewed movies,” he said. “The Dark Tower,” featuring Matthew McConaughey and Idris Elba, was panned by critics, putting a damper on the likelihood of imminent spinoffs, though a TV series is planned. The film generated only 18 percent positive reviews, according to aggregator Rottentomatoes.com. After the embargo on reviews lifted, analysts at BoxOfficePro.com reduced their estimates on “Dark Tower” to $17.2 million. Elba features as the Gunslinger, Roland Deschain, who has been locked in an eternal battle with Walter O’Dim, played by McConaughey and known as the Man in Black. Deschain’s mission is to stop the Man in Black from toppling the Dark Tower, which holds the universe together. The film is a sequel to the book series. Sony and Media Rights Capital were co-producers on the picture, which cost an estimated $60 million, according to Box Office Mojo. Meanwhile, acclaim for “Dunkirk” has kept crowds turning out for the World War II movie from Time Warner Inc.’s film division. It was forecast to generate $17.3 million, according to analysts at BoxOfficePro.com. “Kidnap,” from Beverly Hills, California-based distributor Aviron, took in $10.2 million in its debut. The R-rated action thriller featuring Halle Berry scored 41 percent positive reviews via Rottentomatoes.com. Berry plays single mom Karla Dyson, who sets in pursuit after her son disappears. It was forecast to generate $8 million, according to researcher Box Office Mojo.